1. Preheat the oven to 400°. In a medium bowl, toss the potatoes with the olive oil. Place cut side down on a baking sheet and bake until the skins are crisp, 20 to 25 minutes; let cool. 2. Scoop out the center of each potato half and place in a medium bowl. Stir in the sour cream, blue cheese, bacon, parsley and onion. 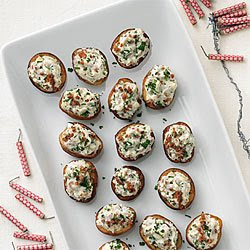 Fill each potato skin with the sour cream mixture and top with more crumbled bacon and parsley.